How else is Peter supposed to think? He is human, after all. But that is the point: He is more than Human, He has been given God’s Grace, God’s Life! Peter is being called to learn to think and see as God thinks and sees, and he is given the power of grace to do so. It is about not steering from the path God gives us to travel, even if it demands struggle, rejection or suffering for the sake of justice, peace and love. We, like Peter, have begun with our Baptism, to live not just humanly, but with God’ own Life! 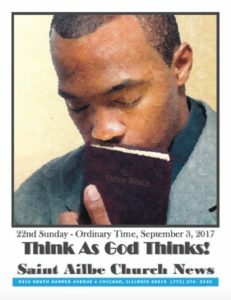 And so we are called to learn to think as God thinks!